be combined to suit your needs! This platform (an improved version of Reduced Representation Bisulfite Sequencing for greater coverage) can be used to detect 3 to 4 million unique CpG sites, allowing >85% coverage of all CpG islands and >80% of all gene promoters for a maximal amount of methylation data from less sequencing reads, reducing the overall cost. The system is conducive to biomarker discovery by providing for the identification and analysis of differentially methylated regions (DMRs) between samples. The Methyl-MaxiSeq platform (whole-genome bisulfite sequencing) is for the detection of DNA methylation across the entire genome. DNA methylation information is provided in CpG context as well as in the less common CHG and CHH contexts. The platform attains an average read coverage of 15-20X per base (for the human genome). This can be modified depending on your requirements. Since whole-genome sequence is provided, SNP analysis can be performed simultaneously. (Reduced Representation Bisulfite Sequencing) combines restriction enzyme digestion with bisulfite sequencing to enrich for a CpG-dense fraction of the genome. DNA methylation occurs predominantly in CpG contexts, and these CpG di-nucleotides are more abundant in select regions of the genome. Classic RRBS covers ≥70% all CpG islands, >75% all gene promoters, and detects 1.5-2 million unique CpG sites in human, mouse, or other mammalian genomes. Zymo Research's Epigenetic Services take care of every step of genome-wide epigenetic analysis. 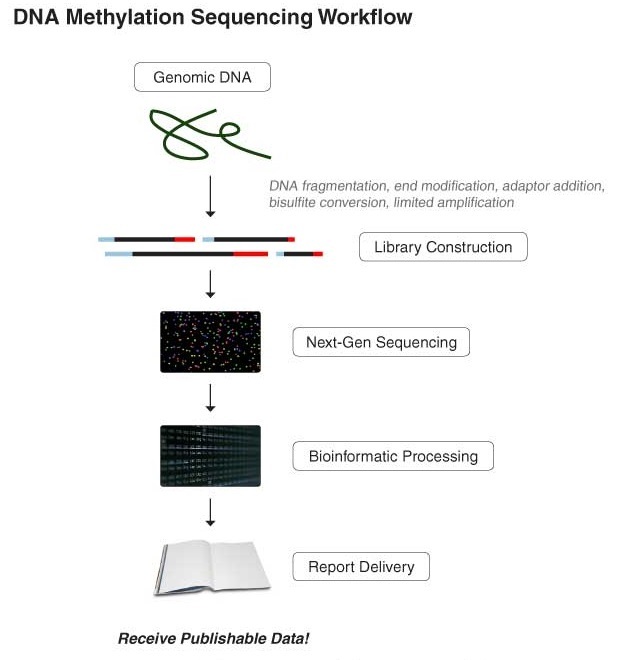 Our experienced team performs all of the library prep procedures and the Next-Gen sequencing, and uses customizable bioinformatics pipelines to analyze the data to deliver publication-ready figures and graphs. Two kinds of UCSC Genome Browser tracks are provided for visualization of methylation data: the Methylation track and the Read track. 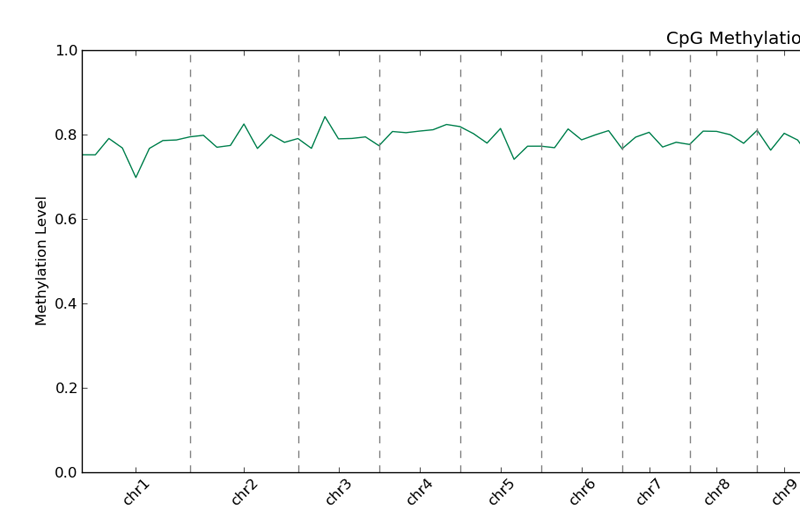 The Methylation track indicates methylation ratios (percent methylated) at each site, and the Read track alignment to the reference genome. 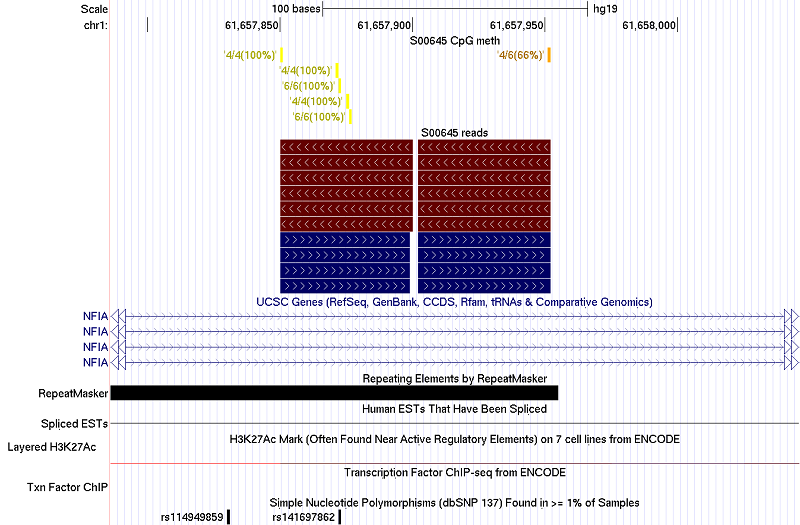 Simply copy and paste provided tracks into the UCSC Genome Browser to access gene annotations, SNPs, repetitive DNA elements, and comparison to results of the ENCODE project for each region. The hexbin plot is an updated version of the scatterplot that is better suited for analysis of very large data sets. 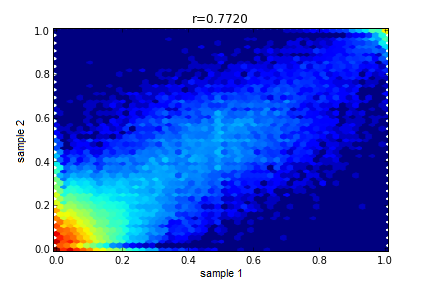 It indicates the correlation between two samples with the Pearson's R correlation coefficient displayed at the top. Colors, at the indicated location on the plot, represent point densities with Red indicating points comprised from many values and Blue showing points from only a few values. 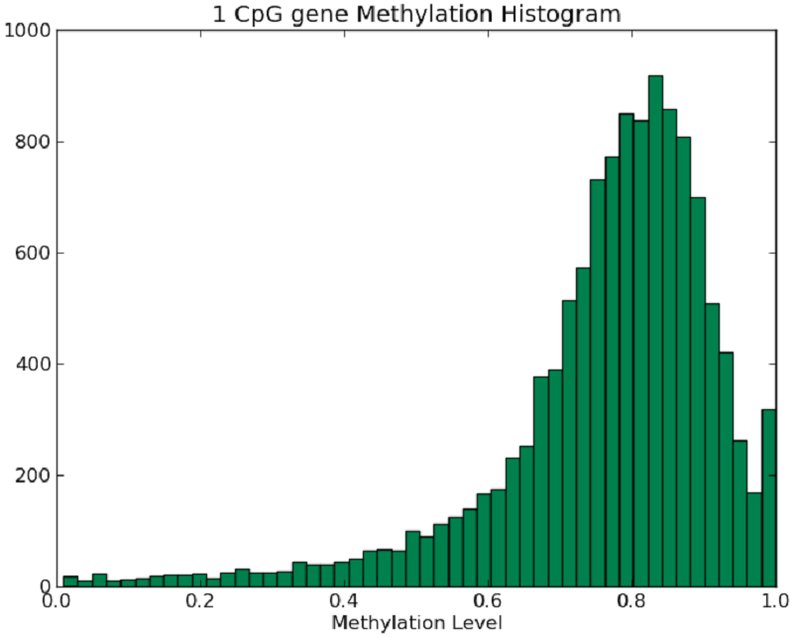 The Methylation Histogram shows how CpGs were distributed in terms of methylation level. The x-axis is methylation level from non-methylated to full-methylated. 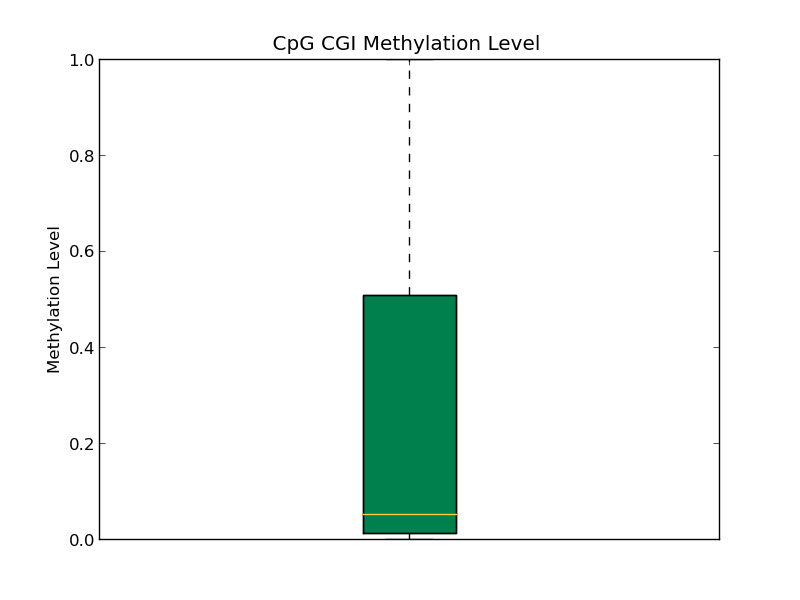 The y-axis indicates CpG counts in certain methylation level. The heatmap provides statistical grouping and easy visualization of samples according to DNA methylation levels. 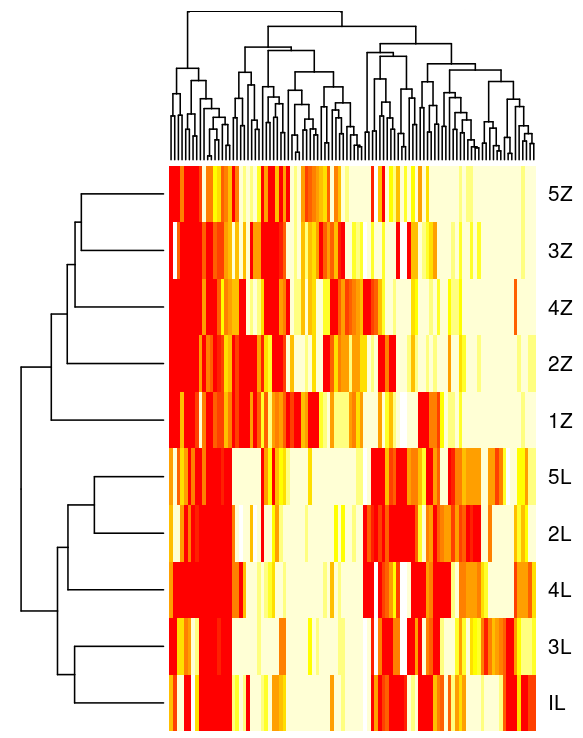 In this heatmap (above), Red represents CpG sites that are 0% methylated and Yellow sites with 100% methylation. Dendrograms of hierarchical clustering based on methylation ratios help determine which samples share similar methylation patterns in specific regions of their DNA. The Region Coverage Pie Chart indicates the read coverage (fold) for an indicated region, in this case, for CpG islands. Region coverage pie charts are available for promoter, gene body, exon, intron, and intergenic regions. The boxplot displays the mean and distribution of DNA methylation within a sample. The boxplot (above) shows the 2nd quartile (median) as a yellow line, and 1st quartile and 3rd quartile as the bottom and upper bounds of the box, respectively. The Methylation Overview plot displays the DNA methylation ratio (percent methylated) across the entire genome for quick analysis of DNA methylation levels across all genomic regions. 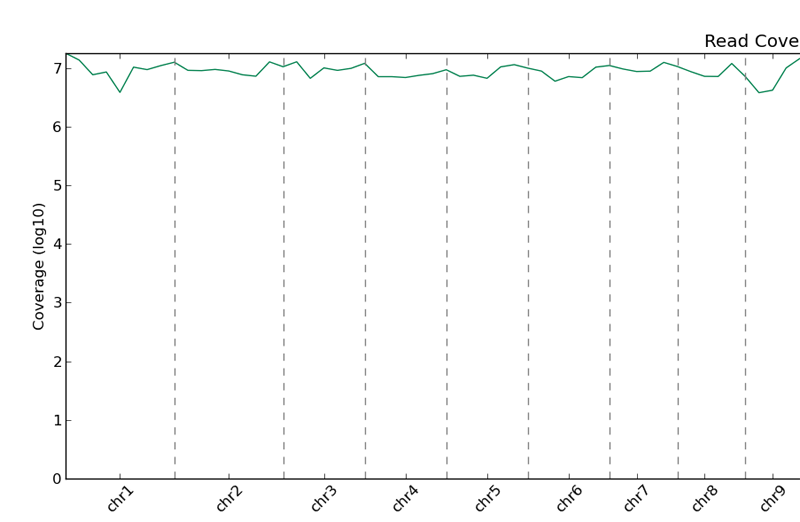 The Read Coverage Plot shows the read coverage on a log scale across entire genome for easy visualization of the extent of coverage in the regions analyzed. Study authors investigated DNA methylation changes in mouse skeletal muscle following a 4 week regimen of regular exercise. Using Zymo Research’s Methyl-MiniSeq platform, Kanzleiter et al. 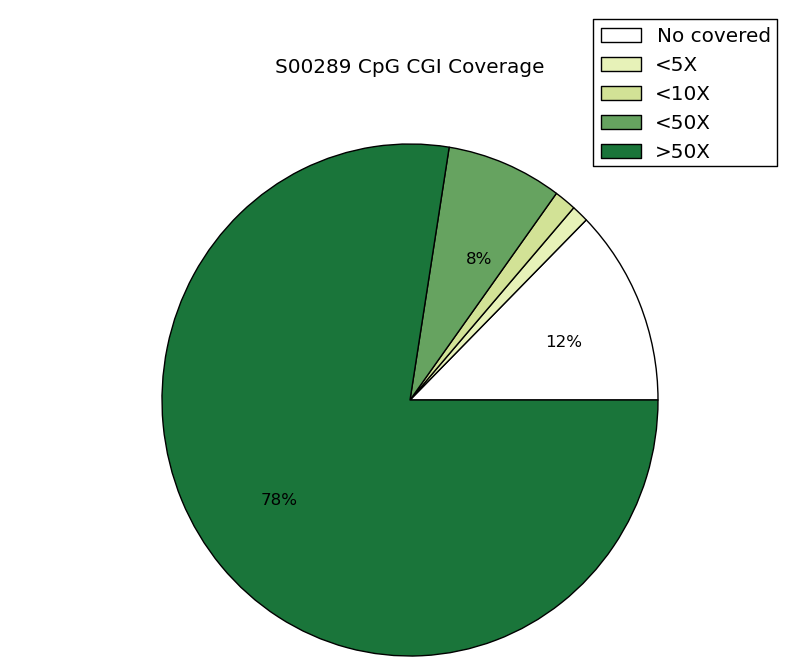 detected 3692 differentially methylated CpGs distributed among 2762 promoter regions. When coupled with gene expression profiles, integrated analysis revealed 361 genes in which changes of DNA methylation were associated with changes in gene expression. These genes included those related to muscle growth and differentiation as well as metabolic regulation. Researchers sought to better understand epigenetic changes that occur in hepatic stellate cells (HSCs) upon activation. Götze, et al. stimulated HSC activation by altering in vitro culture conditions. The genome-wide DNA methylation patterns were then determined using the Methyl-MiniSeq service from Zymo Research. The data revealed approximately 400 differentially methylated regions and, according to DAVID pathway analysis, contained genes enriched for processes relevant during HSC activation. Furthermore, locus-specific validation tests revealed that DNA methylation changes correlated with gene expression changes of select genes. The researchers went on to show that the DNA methylation changes are likely the result of an active, as opposed to passive, demethylation mechanism. Researchers investigated how alcohol affects the regulatory mechanisms needed for normal stem cell differentiation and embryonic development. Study authors utilized genome-wide DNA methylation analysis services provided by Zymo Research to help characterize epigenetic and gene expression changes in human embryonic stem cells (hESCs) exposed to low amounts of alcohol (Ethanol, EtOH). Genome-wide analysis revealed that alcohol exposure caused a significant amount of regional promoter hypermethylation, especially affecting segments of chromosomes 2, 16, and 18, and differential expression in undifferentiated hESCs versus controls. The study authors also found that EtOH exposure affected key pathways involved in normal cell function, such as metabolism, and reduced hESC pluripotency. Khalid, O, et al. (2014) Gene expression signatures affected by alcohol-induced DNA methylomic deregulation in human embryonic stem cells. Stem Cell Research. 12(3): 791-806. Researchers investigated the effects of di-(2-ethylhexyl) phthalate (DEHP), a ubiquitous plasticizer and a known endocrine disruptor, on DNA methylation changes in the adrenal gland of adult male rats exposed to DEHP in utero. Using the Methyl-MiniSeq™ service from Zymo Research, study authors found 972 differentially methylated CpGs out of 2,183,479 CpG sites surveyed throughout the genome. Most differentially methylated CpGs were found within CpG islands (40%). Interestingly, the second highest frequency of differentially methylated CpGs were found within shore/shelf regions (30%). By contrast, promoter regions did not contain a significant number of differentially methylated CpGs, suggesting that DEHP targets epigenomic regions that regulate tissue-specific expression. The researchers also identified several hotspots of differentially methylated CpGs that coincided with regions of differentially expressed genes. Two such hotspots at chr20p12 correlated with deregulation of gene expression. That region contains genes critical for the proper function of the immune system. The study’s findings support the notion that the typical amounts of DEHP present in the environment may influence a significant number of regions across the epigenome. Martinez-Arguelles, DB & Papadopoulos, V. (2014) Identification of Hot Spots of DNA Methylation in the Adult Male Adrenal in Response to In Utero Exposure to the Ubiquitous Endocrine Disruptor Plasticizer Di-(2-ethylhexyl) Phthalate. Endocrinology. 1(1):124-33. Researchers utilized Zymo Research’s Methyl MiniSeq and Targeted Bisulfite Sequencing services to identify and validate methylation markers linked to colorectal cancer (CRC) in African Americans. Genome-wide methylation analysis with Methyl MiniSeq revealed 355 differentially methylated CpG sites in 13 genes in addition to hypomethylated Long INterspersed Elements (LINEs) in CRC samples. Furthermore, six of these genes contained the 50 CpGs with the highest degrees of differential methylation and were then studied further using 42 samples and Targeted Bisulfite Sequencing. With the larger sample set and more focused sequencing, the authors were able to validate four genes, EID3, BMP3, GAS7, and GPR75, as novel CRC methylation markers in African American patients. The Methyl-MiniSeq service was used by the authors to determine the role DNA methylation has in stabilizing gene expression of embryonic stem cells transitioning between cellular states. The expression of a pluripotent marker, Rex1, was found to be correlated with the expression of key methylation factors: Dnmt3b, Tet1, and Prdm14. Methyl-MiniSeq data showed that cells in the Rex1-low state had higher levels of promoter methylation compared to those in the Rex1-high state. Differential methylation occurred at the promoters of key ESC regulators such as Esrrb, Tet1, and Tcl2; these results correlated with the differential gene expression observed by single-molecular RNA-FISH (smFISH). Furthermore, cells with DNA methyltransferase knock-outs or those treated with a DNA methylation inhibitor had fewer cells in the Rex1-low state. These findings suggest that methylation is required for the transition between two cellular states and its maintenance. Singer, Z, et al. (2014) Dynamic heterogeneity and DNA methylation in embryonic stem cells. Mol Cell. 55(2): 319-331. doi: 10.1016/j.molcel.2014.06.029. Researchers examining the epigenetic modifications in oral keratinocytes following Epstein-Barr virus (EBV) infection used an expanded and streamlined version of Reduced Representation Bisulfite Sequencing and bioinformatics analysis (Methyl-MiniSeq). The group found that EBV infection induced long-lasting DNA methylation changes at CpG islands, promoters, and within gene bodies when compared to uninfected cells. Furthermore, the DNA methylation changes correlated with gains and losses in expression of a subset of affected genes. The findings provide mechanistic insights as to how EBV infection contributes to DNA methylation changes commonly observed in EBV-associated carcinomas and hints at the potential for future epigenetics-based therapies. Birdwell CE, et al. (2014) Genome-wide DNA methylation as an epigenetic consequence of Epstein-Barr virus infection of immortalized keratinocytes. J Virol. pii:JVI.00972-14. The Methyl-MiniSeq (expanded-RRBS) service from Zymo Research was used to study how disturbed blood flow (d-flow) epigenetically regulates endothelial gene expression and causes endothelial cells to initiate and sustain the development of plaque that contributes to atherosclerosis. Using the Methyl-MiniSeq platform, the researchers found that sections of carotid artery exposed to d-flow exhibited significantly higher levels of hypermethylated CpG sites compared to sections of carotid artery not exposed to d-flow. The method also revealed that treating mice with the DNA methyltransferase (DNMT)-inhibitor 5Aza reduced the number of hypermethylated CpG sites in endothelial sections exposed to d-flow. These findings suggest that DNMT is the mechanism by which d-flow induces genome-wide DNA methylation changes in endothelial cells. Dunn J, et al. (2014) Flow-dependent epigenetic DNA methylation regulates endothelial gene expression and atherosclerosis. J Clin Invest. 124(7):3187-3199. doi: 10.1172/JCI74792. Using the Methyl-MiniSeq service, study authors investigated how the BCL6 oncogene contributes to diffuse large B-cell lymphoma (DLBCL) development. The investigators used a mouse model in which Bcl6 expression was restricted to hematopoietic stem/progenitor cells (HSPCs) and found that BCL6 predisposed developing B-cells to a malignant fate. Data generated via the Methyl-MiniSeq service helped identify epigenetically reprogrammed DNA methylation patterns in HSPC genomes. The proposed “hit-and-run” model for BCL6 driven tumor development suggests a possible reason as to why certain treatment strategies fail in some lymphoma patients and not others and suggests new avenues for potential therapeutic development. Green M, et al. (2014) Transient expression of Bcl6 is sufficient for oncogenic function and induction of mature B-cell lymphoma. Nature Communications. 5:3904. doi: 10.1038/ncomms4904. The study’s authors used Zymo’s Methyl-MiniSeq service to identify genome-wide DNA methylation pattern changes in the brain tissues of mouse offspring whose pregnant mothers were fed a diet 10 times higher in folic acid concentration compared to low folic acid controls. The researchers found significant changes in the global patterns of DNA methylation between the two groups of mouse pups. Furthermore, the study showed significant changes in the levels of methylated cytosines in both CpG as well as CHG and CHH contexts in CpG islands, gene promoters, gene bodies, and non-coding regions at single-base resolution. In many cases the DNA methylation changes correlated with differential gene expression as measured by quantitative real-time PCR. The findings suggest that maternal folic acid supplementation may profoundly influence methylation and developmental patterns in children and has substantial implications for the observed recent increase in diseases such as Autism Spectrum Disorder. Barua S, et al. (2014) Single-base resolution of mouse offspring brain methylome reveals epigenome modifications caused by gestational folic acid. Epigenetics Chromatin. 7(1):3. doi: 10.1186/1756-8935-7-3. The Methyl-MiniSeq® (expanded RRBS) Service from Zymo Research was used to investigate genome-wide changes in DNA methylation in mouse medulloblastoma cancer models. The authors detected relatively few cancer-specific regions that exhibited DNA hypermethylation, which was different from what was previously observed for human cancers. The researchers next investigated genome-wide DNA methylation patterns in mouse models for additional types of human cancers, including breast cancer Burkitt’s lymphoma. They found different methylation patterns in the mouse models than their human counterparts, suggesting that some types of cancers require development of better animal models to use for studies related to cancer diagnostics and therapeutics. Diede SJ, et al. (2013) Fundamental differences in promoter CpG island DNA hypermethylation between human cancer and genetically engineered mouse models of cancer. Epigenetics. 8(12): 1254-1260. Researchers used the Methyl-MiniSeq® Service from Zymo Research to investigate the mechanisms responsible for establishment of rhabdomyosarcoma (RMS) tumors in children. Rhabdomyosarcomas are pediatric skeletal muscle cancers that form due to incomplete differentiation of muscle cells. MyoD is a cellular factor that generally drives the differentiation of normal skeletal muscle cells, but is not able to do so in RMS cells even though it is expressed to normal levels. In this report, the authors used Methyl-MiniSeq® to demonstrate that one of the MyoD target genes responsible for muscle differentiation, JDP2, is not expressed due to DNA hypermethylation in its promoter region, and that this epigenetic silencing likely contributes to the lack of differentiation in rhabdomyosarcoma cells. MacQuarrie KL, et al. (2013) Comparison of genome-wide binding of MyoD in normal human myogenic cells and rhabdomyosarcomas identifies regional and local suppression of promyogenic transcription factors. Mol Cell Biol. 33(4):773-84. Researchers used the Methyl-MiniSeq® Service from Zymo Research to investigate the DNA methylation profiles of a mouse model for multiple myeloma. Compared to wild type controls, mouse hematopoietic stem/progenitor cells ectopically expressing the MafB oncogene underwent specific epigenetic reprogramming that predisposed activated plasma cells to a cancerous fate. The findings suggest a novel MafB-mediated "hands off" epigenetic molecular mechanism for multiple myeloma and associated plasma tumor cell initiation, and provide insight for innovative, targeted cancer therapy. Vicente-Dueñas C, et al. (2012) A novel molecular mechanism involved in multiple myeloma development revealed by targeting MafB to haematopoietic progenitors. EMBO J. 31(18):3704-17.